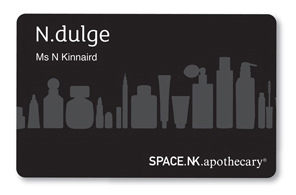 If you’re a Space NK regular, don’t forget to N.Dulge! I love store loyalty cards (as my Boots Advantage card will happily testify) and so I was delighted to hear about the new(ish) Space NK scheme that gives something back! N.centives. £1 = 1 point, for every 100 points you’ll receive a £5 N.centive (reward). I signed myself up a few weeks ago after CityGirlsFashionBox ordered me to do it and am waiting for my card to drop through the door any day now (hurryup hurryup hurryup). It’s free to sign up so if you’re a Space NK shopper, whatchu waiting for? Love boots card it sent me a free lipstick voucher today for clinique. Love it even more now! Thanks for the heads up on that!! Just ordered mine! lol 1 point per spent £1?! with 100 points (so basically £100 spent) you get £5 reward? well that’s a tad ridiculous, isn’t it?! Well I’m not gonna sniff at getting free money back on the shopping I do! The biggest ‘general’ discount we ever get is 10% on cosmetics (think Debenhams BlueX Sales) and that’s time limited, so I’m quite happy to take what equates to 5% (admittedly to be re-spent instore) on a non time-limited offer. Perhaps my maths are wrong (they were never my strong point) but with Boots (4pts per £1 spend) that only equates to £4 back per £100 spend making this a better deal? Maybe I’m going crazy… you’ve got me at the calculator now! fyi i got a fab eve lom lipbalm for my birthday from them and they really do have fab customer service, i emailed them around christmas and they called me back asap to answer my q.! Too bad, hun! You shoulda received one before Christmas because I got a £10 Christmas gift from SpaceNK on my card and I bought Laura Mercier TM for £10! Also, I got the Eve Lom lip balm as my freebie for my Birthday! Argh, need to sign up for one soon if you’ve gotta wait for the thing to pop through the post! I’m planning on splurging on a clarisonic for my b-day, so definitely want the points for that! Any idea how long it takes for the card to arrive? These are brilliant, I got mine just before Christmas and got a £10 ‘gift’, I like the sound of the 20% events and birthday treats too! Technically it is a better deal than Boot’s basic rate. But with all the “buy this, get 200 points” I save up my points a lot quicker than I would otherwise, so it seems more worth it. Plus Space NK is more for luxuries, whereas I can buy my basics and even my lunch at Boots and spend £100 a lot quicker and with less guilt. That said, if I shopped at Space NK I would still probably go for it. The perks seem great, although the dedicated customer service line seems a bit of a laugh. Surely customer service should be available to all customers. Mine arrived today. I get those the free mag anyway though. I bet I hardly use it! I’m so glad the store asst. told me about this before xmas, they gave me £10 credit to spend as a chrimbo pressie!